I wrote about the debt snowball 7 years ago to the day and thought it may be useful if we reposted it again as it was (and still remains) one of the most important systems I used to get rid of my debt. The debt snowball was made popular by Dave Ramsey and has many adherents. Please share ways in which you’ve been able to rid yourself of debt. I’ve written about the debt snowball in previous posts. So, today I want to discuss it more in-depth and help you get one going for yourself if you want to get out of debt in the most efficient (I think) and timely manner possible. First, you need to gather all your debts. Organize them in order from the lowest balance to the highest balance. Next, you are going to focus all your energy on paying off that lowest balance first. There are several reasons for this, but most noteworthy is the fact that when you get it paid off, you’ll gain a lot of confidence and hope. Make sure you are paying the minimum payment on all other debts besides the lowest balance. I realize this is a no-no if you have only one debt – but we are mainly addressing many debts/deep “debtdom” here. Put as much money as your budget will allow on that lowest balance. After the lowest debt has been paid in full, take what you were paying on it and roll it over into the next lowest debt balance (along with that minimum balance you were paying). Good luck with your debt snowball. Keep at it and you’ll be surprised at how quickly your debt goes bye-bye! Excellent post! Snowball is my preferred debt payoff method. It’s worked really well for me. Thanks for the illustration! 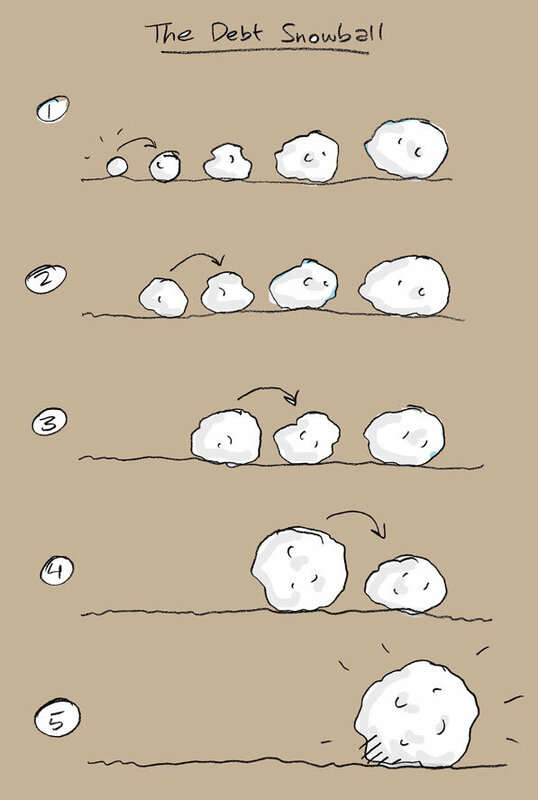 I’ve always wondered how that works, it’s great way to explain/illustrate it.